The Wellness Center rolled out text-based therapy, but its efficacy is still unproven. American college students are at the forefront of a national crisis; in the past two decades, the prevalence of mental health issues has skyrocketed among young people. Students born in the 1990s and 2000s are lonelier, sadder and more anxious than their older counterparts. NYU is by no means immune — at least 18 students have committed suicide since 1990, including two medical school students within the span of five days last spring. The NYU Wellness Exchange hotline was established in 2004 to provide a 24/7 resource to students in need of immediate mental health support. 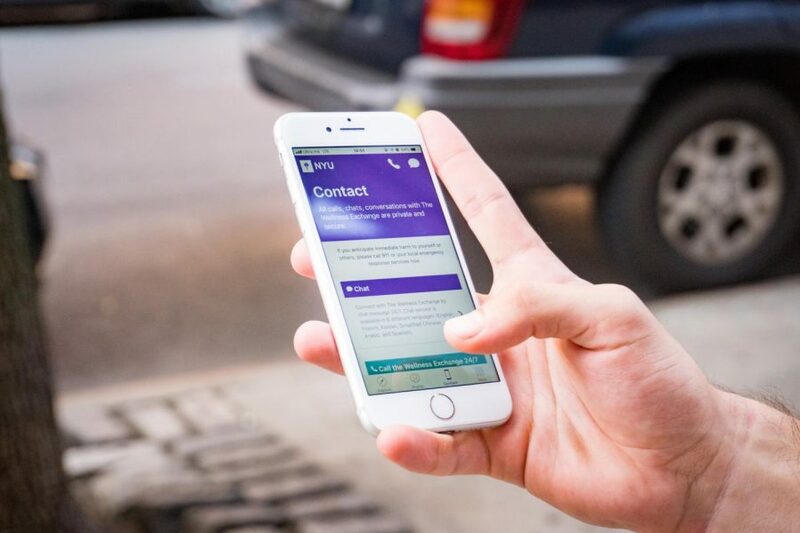 As of this year, the Wellness Exchange offers a new service: an app allowing NYU students to chat with a therapist at any time of day or night. According to Zoe Ragouzeos, director of NYU’s Counseling and Wellness Services, the service is intended to cater to a demographic that prefers to communicate over text. But scientists have yet to reach a verdict on chat-based therapy programs — a new, somewhat controversial method of providing mental health support. Writing for The Outline earlier this year, journalist Paris Martineau spoke with several individuals who had used such programs. The users described receiving unhelpful advice from under-qualified therapists, all the while being charged exorbitant fees for the service. When opening the Wellness Exchange app, the user is prompted to either call the Wellness Exchange office or chat with a therapist. After the user selects the chat option, they are prompted to read three short documents on informed consent, data privacy and personal details. The user is also asked if they are at immediate risk of self-harm or harming others. To more accurately report on this topic for WSN, I downloaded the app and conversed with a text therapist about a legitimate issue affecting my life — trying to juggle numerous time-consuming responsibilities in addition to school. After going through these prompts, I started a chat conversation with “Rep. Marina K.,” who asked how she could be of aid. After I described various stressors in my life, she told me I would be transferred to a counselor; after waiting 23 minutes, “Counselor Sharon L.” picked up where Marina left off. Sharon asked me several questions about my struggles, described an analogy in which I was a water kettle — and my mounting responsibilities constituted excess water being poured into the kettle — and asked me to think of responsibilities I may be able to cut down on or delegate to others. About half an hour later, in the midst of our back-and-forth, Sharon abruptly told me the consultation was ending and asked if I had any parting thoughts. I asked if the conversation was ending because of some time limit; she said not necessarily, but felt we had discussed some tools and strategies I could try to apply. Before signing off, she encouraged me to reach out to the Wellness Center if I felt overwhelmed again. Sharon L. is not an NYU employee; she and other chat therapists on the Wellness Center app work for a Toronto-based human resources firm Morneau Shepell. Matthew McEvoy, the firm’s senior director for Student Support, told WSN that its chat therapists work from designated call centers, and must have at a minimum a master’s degree in a “counseling related field” such as social work and receive additional internal training from Morneau Shepell. The firm provides services to over 200 schools in the United States and employs over 4,000 people. One NYU student, a Liberal Studies sophomore who spoke to WSN on the condition of anonymity due to stigmas surrounding mental health issues, recently used the Wellness Exchange chat service for the first time. However, she returned to the app later that day and described a generally positive experience. Some advice was helpful, she said, while some wasn’t. Although she feels the service could help students less comfortable with face-to-face conversations, she strongly feels the service would be inadequate for those who are suffering severely. NYU professor Lawrence Reed, who teaches psychology and specializes in mood and personality disorders, brought up a different concern about chat therapy programs. Because patients are most likely to use these services at their most difficult moments, users could become dependent on their text therapists. According to Martineau’s article in The Outline, the effectiveness — or lack thereof — of chat therapy programs has not yet been thoroughly researched, largely because the services are so new to the field of psychology. In recent years, companies like Talkspace and BetterHelp have built successful business models off of this efficient — but not necessarily effective — medium of therapy. Regardless of long-term impacts, the Wellness Exchange app’s chat therapy service offers NYU students a new means of seeking out help. Whether the app increases the accessibility of therapy or drives students away from more helpful methods of treatment may remain unclear for years to come. Editor’s note: Paris Martineau, a freelance journalist mentioned in this article, was a WSN editor during the 2016-2017 academic year. Alex is a sophomore at NYU, studying Politics and Journalism.